Members of the Columbia Fireflies @columbiafireflies formulated a team of runners to participate in the Palmetto200 Relay Race March 24-25, 2107. The race originated in Columbia, SC, led runners on a scenic route through the Palmetto state, and finished in Charleston (Patriots Point) midday on 3-25-17. Palmetto200’s “Rules of the Road” mandate that runners wear a reflective vest with blinking lights and a headlamp between the hours of 7:00pm and 7:30am. 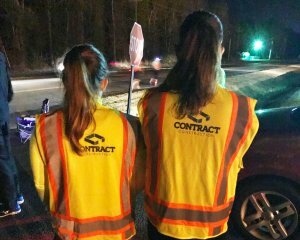 Contract Construction was proud to provide the Firefly team with safety vests for the event. For more information about The Palmetto200 Relay events, click here. Visit the Columbia Fireflies @columbiafireflies or click here to learn more about game times and events.